When I woke up in the morning, Moscow was already a distant memory. In the frame of the train window hung a painting of monochrome austerity from which the nocturnal journey had extinguished every urban element. Pale yellow steppe grass occupied the lower half of the picture, stone grey sky the upper, sharply divided by the knife blade of the horizon. Every now and then birches crossed the picture, straws in the boundlessness of Eurasia. I woke up very early. Almost everyone else was still asleep; only my grey-bearded compartment neighbour nodded a silent good morning to me. He sat at the window reading. His book was called The Murderess with the Tender Eyes. The conductress brought me tea. I blew over the edge of the cup to cool it, as I stared, not fully awake, into the infinity behind the train window. Thus began the ritual bargaining I have so often experienced on Russian trains: your life story for mine. He pressed an invisible rifle to his shoulder and aimed from the train window. Silent shots convulsed his body as he killed invisible game along the route. The training job was on an honorary basis, Volodya earned his money as a freight transporter. With his truck he transported racing cars from one competition to the next. He had just come from Moscow, where he had left his transport vehicle until the next race. In a few weeks he would pick it back up. If there was no competition taking place, he transported building materials, furniture, cars, anything that came up. As we talked, the carriage slowly came to life. Blue and white sheets glided from sleep-crumpled bodies, mountains of laundry transformed into human beings. Greetings were muttered, unknown bed neighbours furtively examined; outside the toilet a procession of toothbrushes formed. Collectively our Trans-Siberian community awoke and prepared for a day of sustained idleness. In the afternoon I took a short nap. When I came to again, I was suddenly no longer sure whether I was really seeing the birch trees outside the window for the first time. The monotony of the landscape was confusing. Had the train moved at all while I slept? Or was a tapestry of unchanging landscape transported past the windows, as had been done at the World Exhibition in Paris in 1900, when the Trans-Siberian Railway was presented to an astonished public for the first time? The glamorous luxury cars which Parisian society strolled through at the exhibition were never used in Trans-Siberian reality. Far simpler models commuted between Moscow and Vladivostok when the line was completed in 1904. The first symbolic cut of the spade had been performed 13 years earlier on the Pacific coast by a young boy named Nicholas, who did not realise that he was digging his own grave — three decades later Tsar Nicholas II rolled to Yekaterinburg in a Trans-Siberian carriage, towards his execution. 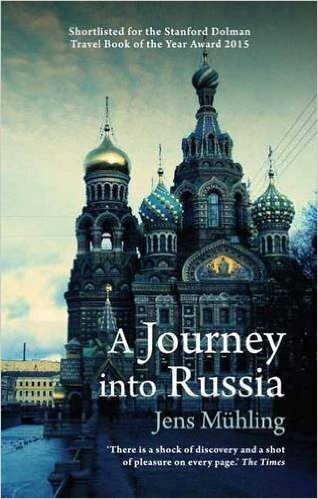 Extracted from A Journey into Russia by Jens Mühling (The Armchair Traveller at the bookHaus). Jens Mühling, born in 1976, was an editor of a German newspaper in Moscow for two years, and has been working for the Berlin newspaper Der Tagesspiegel since 2005. He has been awarded the Axel Springer Prize and the Peter Boenisch Memorial Award for reportage.